We are passionate about teaching kids to know and love Jesus in a place that is fun and safe. The staff and volunteers are excited to partner with families, as your child(ren) learn what it means to be a fully committed follower of Jesus. All of our staff and volunteers have completed Police Record Checks and are identified with name tags. Our nursery is located directly above the front foyer. Caring volunteers will look after your child during the services at 9:00 and 11:00am. Your child will be signed in and out and at which time you will receive a vibrating pager so that you can be reached at any point in the morning. The nursery hosts children from birth through age 2. Sunday School at 9:00am is a busy place with lots of kids. Children are dismissed approximately 10 minutes after the start of the service to their own age appropriate programming located downstairs. We begin our time together with high energy music before being invited into age appropriate classrooms. Classes are offered for 3 year olds through to Grade 8. Preschoolers are taught using First Look curriculum and the elementary classes use D6. Sunday School at 11:00am is a great place to be. Children are dismissed approximately 10 minutes after the start of the service to their own age appropriate programming located downstairs. We begin our time together with high energy music before being invited into age appropriate classrooms. Classes are offered for 3 year olds to Grade 4. Preschoolers are taught using First Look curriculum and the elementary classes use D6. Connect 4 services happen about once every quarter. The “4″ represents the desire to connect kids, youth, adults, and God. These are times when the whole church community worships together. Games, music, skits, and growing as a community ensue! For the 2 and 3 year olds there is an age appropriate activity offered during the sermon. 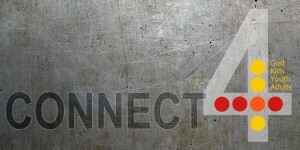 Our next Connect 4 service will be December 20th. Girls Club begins on September 16th and meets every other Wednesday at 6:30pm – 8:00pm. This program is for girls ages 5-9 and is an awesome place to build community and learn what it means to follow Jesus! We eat snacks, play games, create, pray, and look into God’s Word and what it means for us. Sunnyside has in place an active Child Protection Policy that been approved by the church board. All employees and volunteers working with children or youth must be screened through a personal interview, personal reference check and police records check. aware of procedures and their obligations. Our plan to protect includes sign-out procedures. Our child protection policy covers a number of other acceptable and unacceptable behaviours and actions towards children and youth. The Children’s Pastor keeps in regular contact with parents and consults them through a parents committee, to provide updates, receive suggestions for changes, and feedback.